Eisner Award-nominated comic book artist and author Kazu Kibuishi admits that he was "surprised" when Scholastic approached him about designing brand-new covers for all seven "Harry Potter" books. 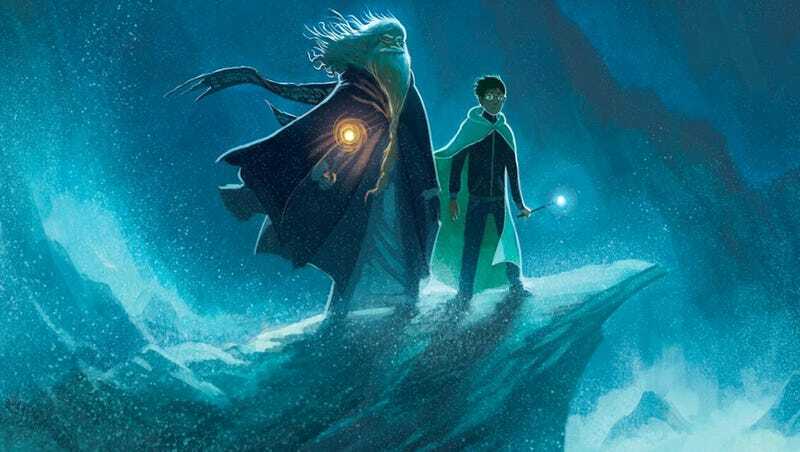 He needn't have worried: The founder of the stunning "Flight" comic book anthology series has brought a whole new dimension to J.K. Rowling's enduring series. Although Mary GrandPré's illustrations are forever tied to nostalgic memories of the series for many readers, Kibuishi had the opportunity to consider the series as a whole while planning his covers. Whether readers are picking up these books for the second, third or tenth time, Kibuishi's illustrations are especially resonant. Kibuishi sat down to discuss how he approached revisiting the look of such a beloved series and discussed his return to his beloved middle grade graphic novel series "Amulet," as well as the three books he always recommends to readers. Scroll down to the bottom to see Kibushi's new covers. What are you most excited about regarding the "Harry Potter" covers? That I'm done? [Laughs.] I'm excited to go back to work on my own book, but at the same time, as far as the reveals go, I'm of course excited to see how people react. I'm actually most excited to see what people think of the entire set, because that's really how I was looking at the whole thing. I'm really excited to see what people think of the back covers because that's something I think that's going to be unexpected. That was a last-minute thing I threw in there. I wasn't sure if Arthur [Levine, vice president and editorial director of Arthur A. Levine Books] was going to go for it, but I said, "This is the way to go!" There's a surprise. A lot of people have asked me to talk about Mary GrandPré's work, and I keep telling them, "Look, we wouldn't know 'Harry Potter' without the scenes she envisioned." She had the most difficult task of defining the look of "Harry Potter." She has a tremendous amount of influence over what I do and what everyone else does [with the series] from here on out. I tell everyone, my job is easy compared to what she had to do. My job is to be a historian and take a look at how we perceive "Harry Potter"—how Mary actually designed it, and also to find some way to re-introduce it to the readers that I already have on my books. How would my readers want to move into reading this kind of fiction? I would take something from "Harry Potter" that I think my kids would want to see. Describe the moment when you first knew that this would be your next project. [Graphix editorial director] David [Saylor] came to me and asked me. I was kind of surprised, like anyone else would've been—"I'm the cartoon guy. Why would you want me to do it?" He had a poster of one of my "Flight" covers on the wall, and he said that when he looked up at that, he thought, "That's what we should do." It was actually really good to know that, because the "Chamber of Secrets" cover was actually influenced quite a bit by the "Flight Volume 3" cover on his wall. I'm also a writer. I actually have people do this kind of [illustration] work for my books. [Laughs.] I tell them, "Can you make those backgrounds look better?" I'm the guy who draws less and less on my own books. Which project are you returning to now that these covers are finished? "Amulet"—that's my full-time job. I believe a lot in focusing on just a few things. When David came to me to do ["Harry Potter"], I initially thought, "I don't know about that." For one, that's a lot of responsibility, and I have my own series to focus on. It took a while for me to realize it would make sense for me to try it. Once I decided that, I gave it my all while bidding for it. I showed them my sample images and said, "I'm going to take a very different approach because I'm an author, and I think I can empathize with J.K. Rowling a little more than the designers can. I know what she deals with when she's sitting in her room, and I know what she deals with when she goes to the schools—I do all those same things." I'm in a unique position to be able to empathize with how I want to see my series reinterpreted. What are you most excited about while working on the new "Amulet" volume? One of the things I've done is set up a mythology that allows me to be very flexible. Every time I do a book, I feel like I'm on a new adventure. I kind of like not knowing some things. I trust my process enough that I just fall into the story. I let the characters take me somewhere. I do outline, but I only use those as signposts that tell me, "You have to go in that direction, you have to be done here," and then I let the characters do the rest of the work. I'm excited to see what the characters do, because I'm putting them in a really crazy situation. Over the course of your life, what's the book you've most often recommended to people, and why? I have recommended "Harry Potter" a lot. People will ask what my favorite books are; my quick answer is that three books are my favorite: "Cannery Row," "The Old Man and the Sea" and "The Time Machine" by H.G. Wells. That's my triumvirate; every time I make a book, I'm chasing those three books. I'm trying to replicate the feeling I get from those three books and combine it with all the fun, cartoony stuff. Is there something about those three novels that complement one another? They're very much like graphic novels because of the length; they're very short. I like writers who write for the memory of the reading experience and not so much for the time that it takes to read it. I think the best writers can create a memory that stays with you for a long time. It doesn't matter if it's only one page long or 500 pages long. As long as that memory can hold, you've created literature in somebody's mind. When I draw my books and I know I only have 200 pages to work with and it's going to be a very short time—I have only a half hour to an hour and a half with somebody—then it has to be about the memory that I create and not the story that I'm writing. The story's only a tool to create the memory. Would you say that with graphic novels, it's specific pages or images that stick in a reader's mind? I encapsulate a moment. I look at the moment and say, "I want you to remember that moment really, really well," so I will write to make that happen. I think that's why [kids] like the "Amulet" books, because it holds. For me, as a young reader, it wasn't that I didn't enjoy reading when I started; it was that I didn't understand a lot of it, so it didn't hold. Then, when I read books that were clear enough for me—they didn't necessarily have to be short, just clear enough—the memory held. "The Phantom Tollbooth" is a fantastic example: The combination of Jules Feiffer's images and Norton Juster's writing created really clear images in my brain about the space, and I wanted to revisit it. Chris van Allsburg's drawings create memories that don't leave your head. "Harry Potter" has that, as well: You remember the moments and the spaces and the places. When you recommend "Harry Potter" often, is it in response to a specific request from people, or is it just your go-to? When I recommend "Harry Potter," often it's to somebody who doesn't always read. It's something that will introduce them to a great story. They're going to read it and say, "Hey, I really enjoy reading!" There's more difficult fiction that I would recommend to some [more experienced] readers who want that special book. My wife is like that; she loves Philip Pullman [and "His Dark Materials"]. It's like "Harry Potter," but there's a different flavor. For some of my friends,Ursula K. Le Guin is the way to go. I try to find the book that would mean so much to that person if they're that kind of reader. But... I think books like "Harry Potter" and "Amulet" were made for the kids who didn't find an interest in [reading]. They will move on to all sorts of wonderful things that we can point them to. This article by Natalie Zutter originally appeared over at Bookish.com.